Cheesecake Apple Salad is an easy no bake dessert salad recipe combining apple salad and cheesecake fluff! 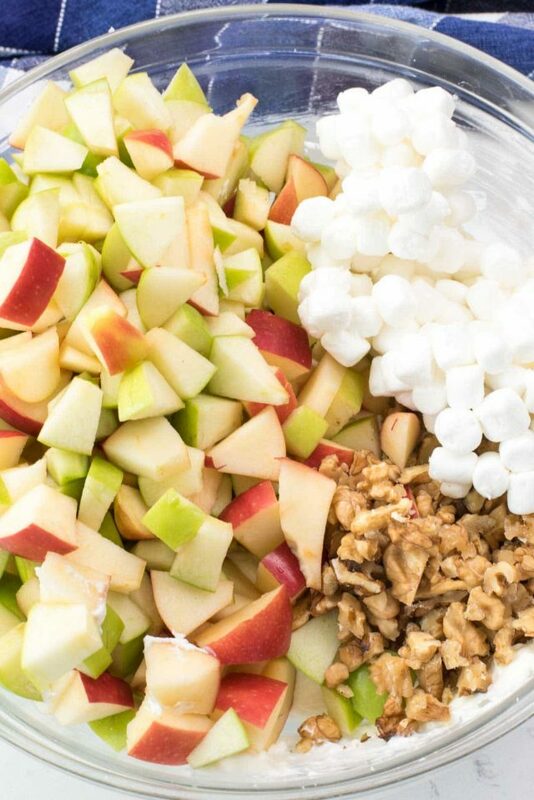 Apples are mixed with marshmallows, nuts, and a no-bake cheesecake for the perfect party side dish. Do you ever have those feelings that, in the moment, time is taking F-O-R-E-V-E-R but then, looking back, it speeds by? I’m totally feeling that way today because it’s Jordan’s last day of 6th grade. This year just flew by, as does every year now, but when she was a baby it felt like every day lasted a year. When she was a toddler I couldn’t imagine her going to Kindergarten. Then, on Kindergarten graduation day I couldn’t imagine her in 4th grade with the “big kids”. And now she’s finished with 6th grade and moving on to Middle School. When I look back and realize how fast time went, I think about how in 6 very short years she’ll be graduating from high school. I am so glad this year is over, but I’m sad too. I’m not sad to say goodbye to her elementary school (I was ready to leave 2 years ago because the principal is…not great) but I am sad that we are leaving the safety of the younger grades. Somehow I am pretty sure that the next 6 years are going to be harder than the first 6. Pretty soon I’ll be wishing she wouldn’t sleep through the night instead of wishing she’d get home so I can go to bed. I’m trying to put the emotions of the day behind me, so instead of focusing on that I’m going to think about what’s next right now: SUMMER! Swim parties, fun in the sun, vacations, and barbecues. I can’t wait for every single one. My goal over the next few weeks is to share some stupidly easy recipes for you; ones that are perfect for potlucks and parties. This Cheesecake Apple Salad is one of the BEST side dish recipes you can make. Everyone loves it – kids and adults. And it’s a salad that I will go to town on for sure! Before blogging I’d never heard of an Apple Salad or a Fluff Salad. I am pretty sure those two dessert salad recipes started back in the 70s when our moms cooked in microwaves from canned food and we lived on cake mix, pudding mix, and whipped topping. Side note: why wasn’t I a mom in the 70s? I’d have been perfect at that. 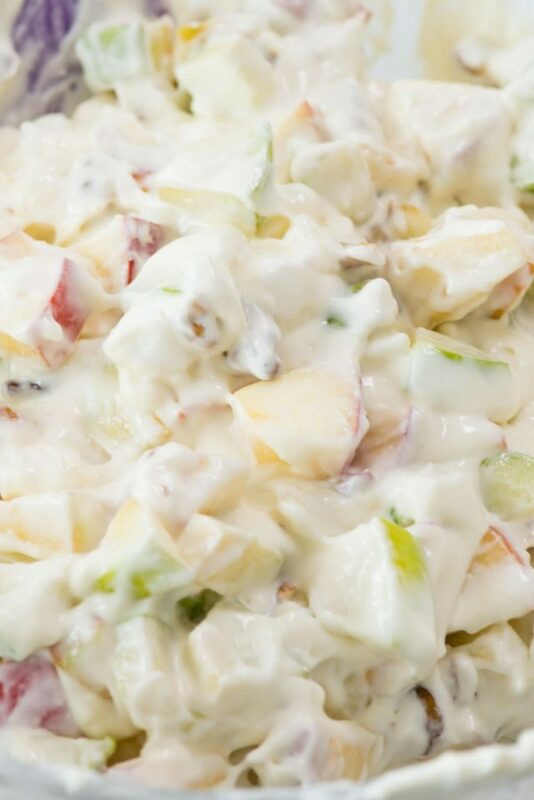 My first introduction to creamy fruit salads was the Snickers Apple Salad you’ve seen all over Pinterest. I’ve made my own version of that using Butterfingers, in case you’re craving peanut butter. 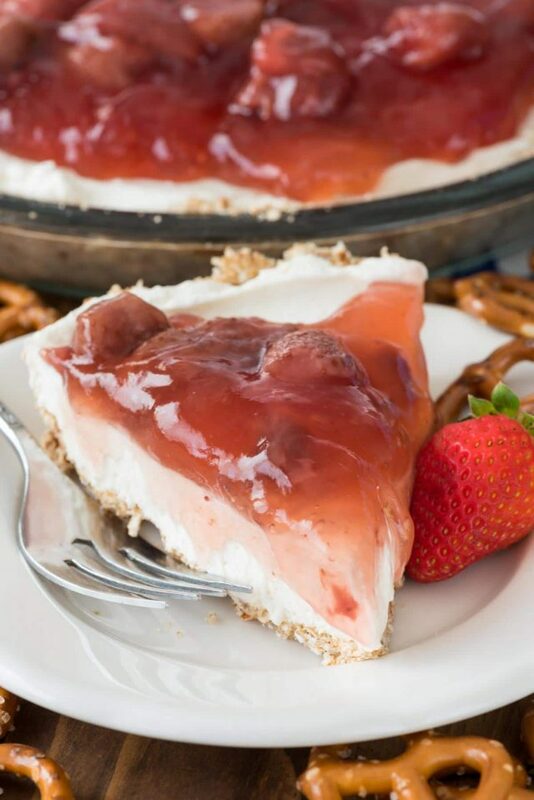 When I was brainstorming ideas for an easy BBQ side dish, this kept popping into my head: a no-bake cheesecake salad. I’ve seen ones made with tropical fruit and berries or bananas or cherries, but I’m not really a fan of any of that kind of fruit. I’m an apple girl, through and through, so I decided to make a cheesecake salad with apples. Then I added walnuts for crunch and marshmallows because, well, why not? Plus, FLUFF salads seem to be all the rage right now and anytime I can add marshmallows to something I’m down for that. 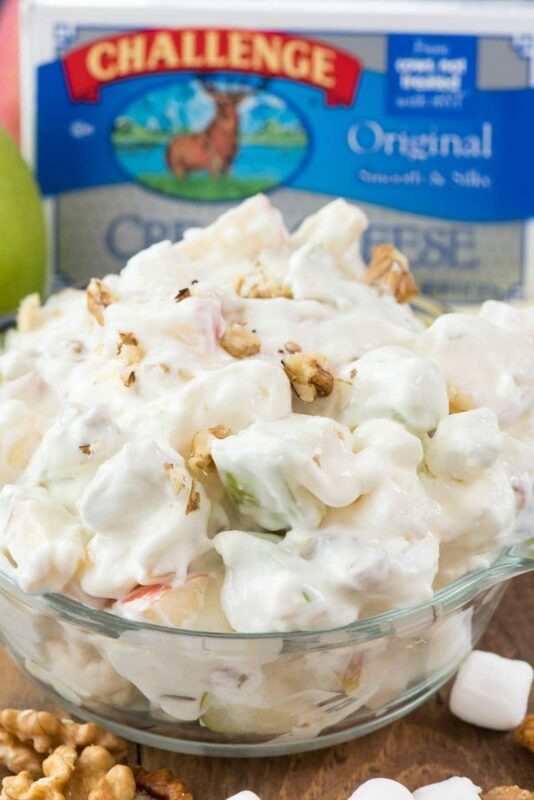 The no-bake cheesecake portion of this cheesecake apple salad recipe is made with my favorite cream cheese: Challenge Cream Cheese. I’ve been working with Challenge Dairy for over a year now and it’s a natural fit for me; I grew up on Challenge Butter. It’s the only brand of butter I use, and the cream cheese is my favorite. It’s smooth and silky and almost spreadable straight out of the refrigerator. I just added a bit of sugar to sweeten the cream cheese, and then mixed it with some whipped topping. 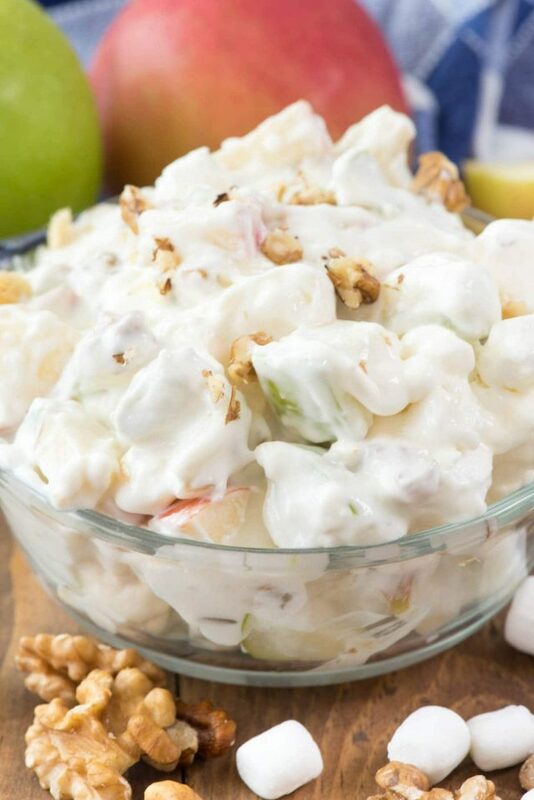 Add in your fruit and nuts and marshmallows and you have the perfect side dish that doubles as dessert. I absolutely LOVE the flavor of a no-bake cheesecake. It was all I could do not to eat the entire carton of this. With 5 apples and an entire block of cream cheese, it definitely makes enough for your next potluck or party. You can use whatever kind of apples you like in your cheesecake apple salad. I used a mixture of Fuji and Granny Smith for a combination of sweet and tart. I also used walnuts but pecans would be fabulous as well. Just don’t forget the marshmallows! This dessert salad is a kids delight…and an adult one too! I can’t wait to serve cheesecake apple salad at my next summer party. 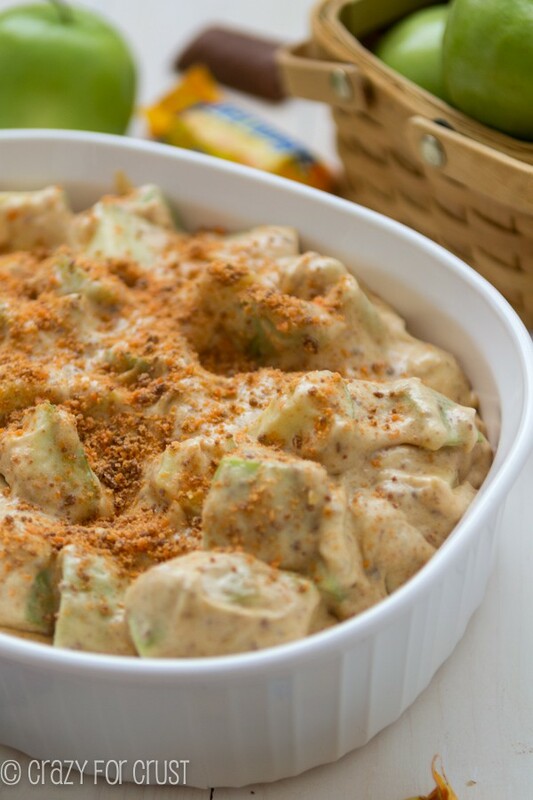 I hope you love the apple salad recipe, too! Cheesecake Apple Salad - this easy no bake dessert salad recipe combines apple salad and cheesecake fluff! Apples are mixed with marshmallows, nuts, and a no-bake cheesecake for the perfect party side dish. Place cream cheese in a large bowl. Beat with a hand mixer until smooth, then mix in sugar. 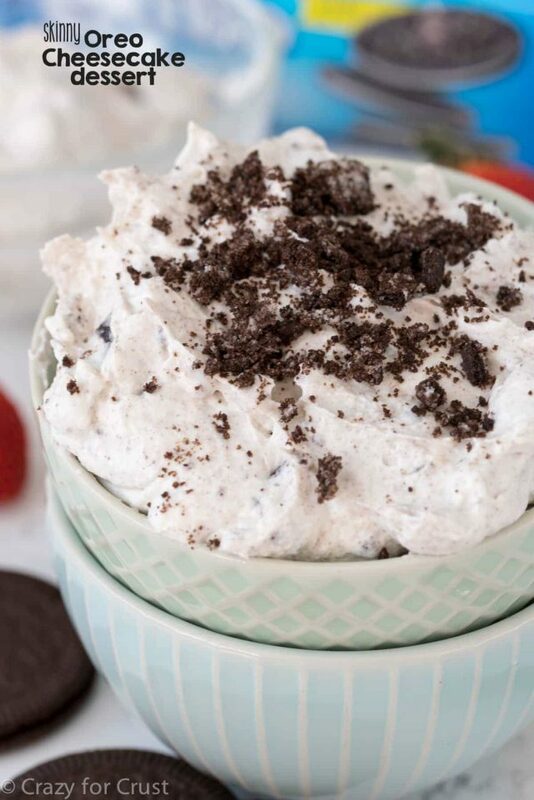 Mix or stir in whipped topping until the mixture is smooth and lump-free. Add the apples, nuts, and marshmallows. Stir to coat. Serve immediately, or store in the refrigerator in an airtight container for up to 24 hours. This post has been sponsored by Challenge Dairy. All opinions are 100% my own. Thanks for supporting me by supporting the brands that make Crazy for Crust possible. Skylar's last day is tomorrow. So true, the moments are long but the years are fast! And this is a perfect 70s throwback, love it! Jordan will do wonderfully in middle school, because you raised her right, and she has confidence to be herself and stand up for herself. Thanks for the throwbacks – I loved the ’70!s! Can I sub the whipped topping for anything?